If you’re working out and eating right, but still have a few problem areas, Dr. Keagle offers the only doctor-performed CoolSculpting in Downtown LA. As you sit comfortably and relax or get some work done on your laptop, the cooling technology can selectively target your abdomen, upper thighs, flanks, love handles, inner thighs or under the chin. FDA-cleared, proven safe and effective, CoolSculpting is a non-invasive fat removal procedure that freezes the fat away with no needles and no downtime. Schedule a free CoolSculpting consultation with Dr. Keagle. Stephanie gets CoolSculpting during a break — and returns to work afterward. After your treatment, the handpiece is removed. Then we massage the area for 5 minutes to promote fat cell loss. BOTOX® Cosmetic (also known as Botulinum Toxin Type A) is safe and effective for combating wrinkles of the face and can be injected in the office with minimal downtime. BOTOX temporarily paralyzes muscles that cause wrinkles, and therefore is not permanent but does require repeat injections. 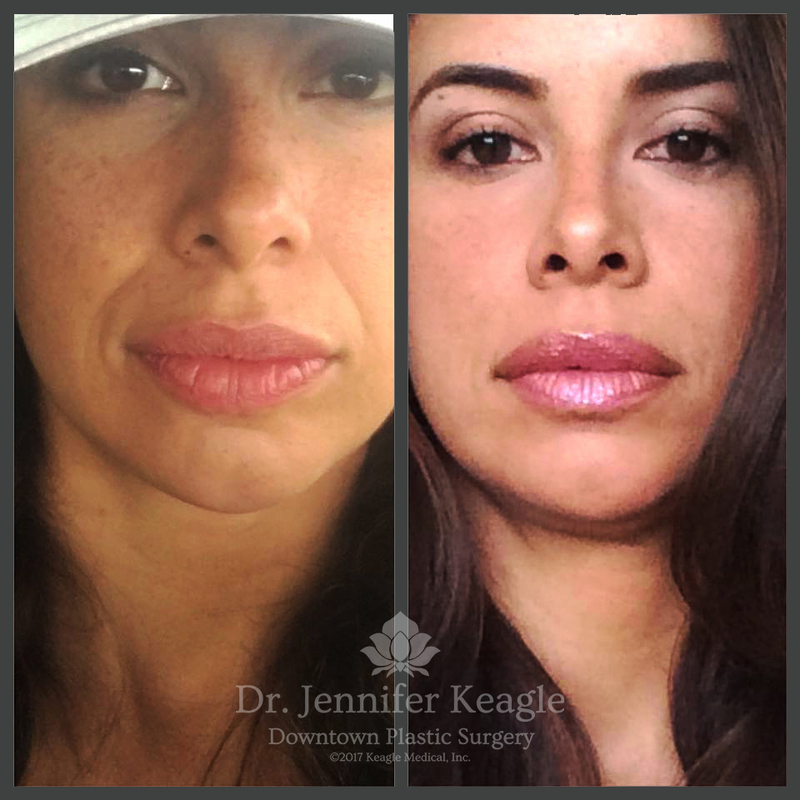 Juvederm and Restylane are fillers that can also be injected in the office with minimal downtime. Used in creases, wrinkles and shallow contours, fillers can also augment the appearance of thin lips. "Dr. Keagle is awesome. I had Botox done somewhere else for the first time, and it was painful and the results where not great. My second time was with Dr. Keagle on my forehead and crows feet. Not only was it not painful but the results are fabulous! She is patient, explains the procedure and gives her suggestions. I will be returning in several months." Dr. Keagle offers two types of laser treatments using Intense Pulsed Light (IPL) technology and the Palomar Lux 1540, a non-ablative laser. Both are easy to tolerate, so you can go right back to work. We typically recommend IPL for facial skin tone normalization, red spots and burst blood vessels. And we use the 1540 for fine lines, smoothing and tightening of skin, brown spots and other undesired pigmentation.